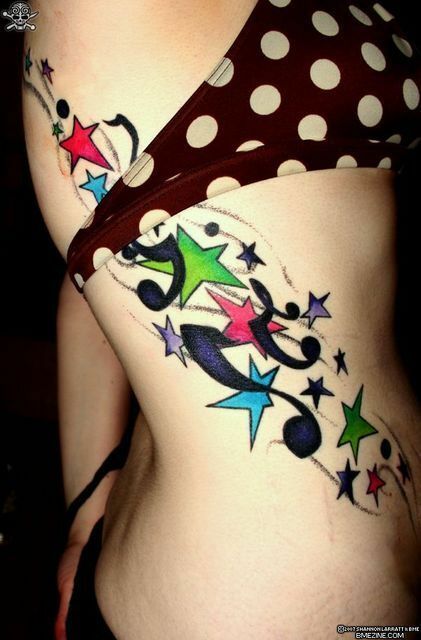 This cool and colorful tattoo includes a variety of images like music notes and stars of different colors and sizes. Although side star tattoos for girls are pretty common these days, this girl went the extra mile and got super creative with her star tat. 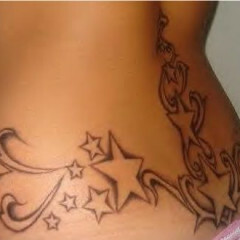 She has a colorful star tattoo inked on her side in a diagonal pattern, extending from her right shoulder around her side to her right hip and stomach area. The unique side tattoo includes pink, green and blue stars, as well as playful musical notes and swirl designs. It’s nice to see a star tattoo that incoporates something that this girl is actually interested in: music. Too many girls get huge star tats inked on their backs or sides without attaching any real meaning to the tat. I wonder how many of these girls change their minds a few years down the road and end up stuck with a silly star tattoo?